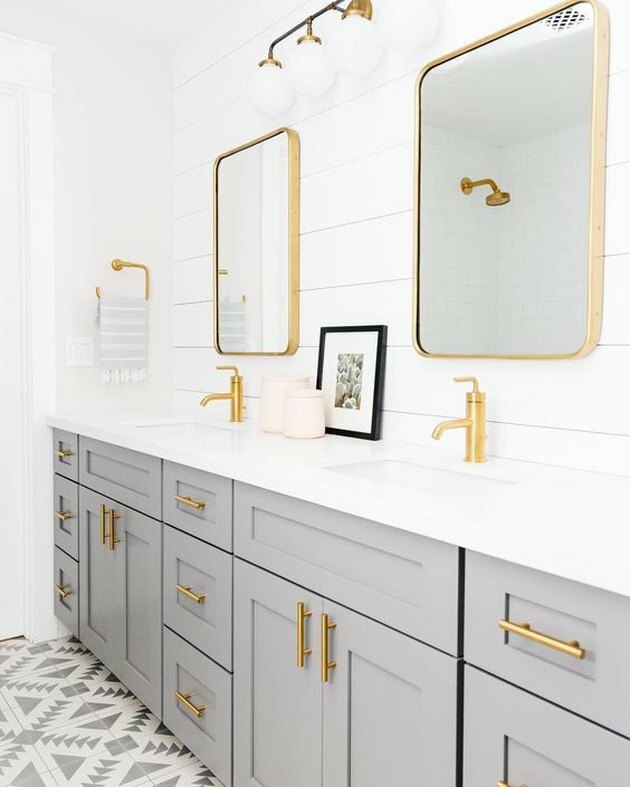 You've seen washrooms flaunting chic black and envy inducing green vanity cabinets, but for some those colors can be a little too much. Of course, all-white is always a timeless go-to, but for some this feels a little too stark. No need to worry Goldilocks, we have the perfect hue for you: gray. From dove gray to charcoal, there are countless soothing shades to choose from. 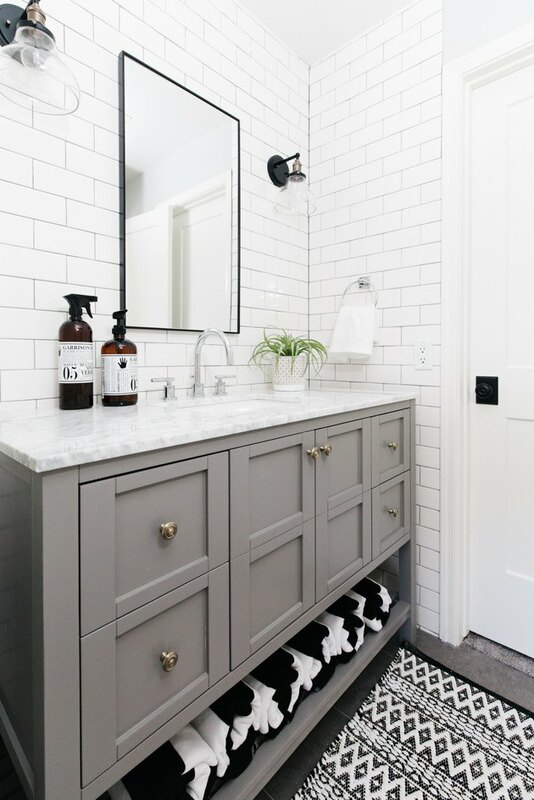 For your consideration: Here are 12 gray cabinet ideas that will transform your bathroom into a spa-like sanctuary that feels just right. Love the farmhouse look, but don't want to go totally rustic? 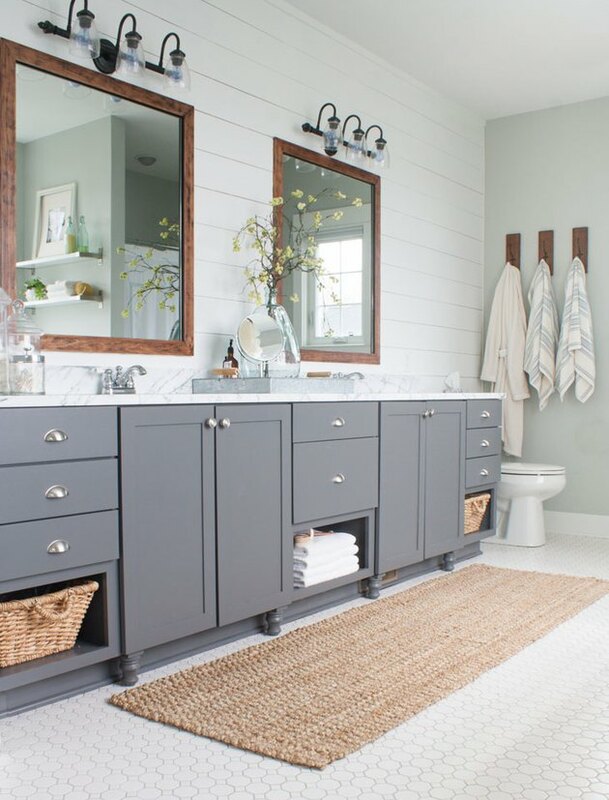 Follow the lead of Kelly from The Lily Pad Cottage, and pair gray cabinetry with a shiplap wall to invoke an inspired cottage-like aesthetic. 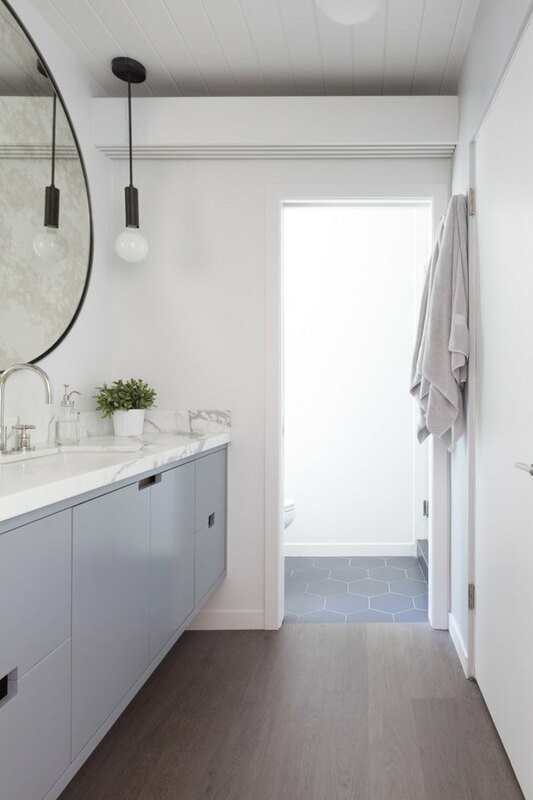 Soft gray cabinets tone down stark black-and-white accents in this modern bathroom designed by MāK Interiors. Who doesn't love subway tile? 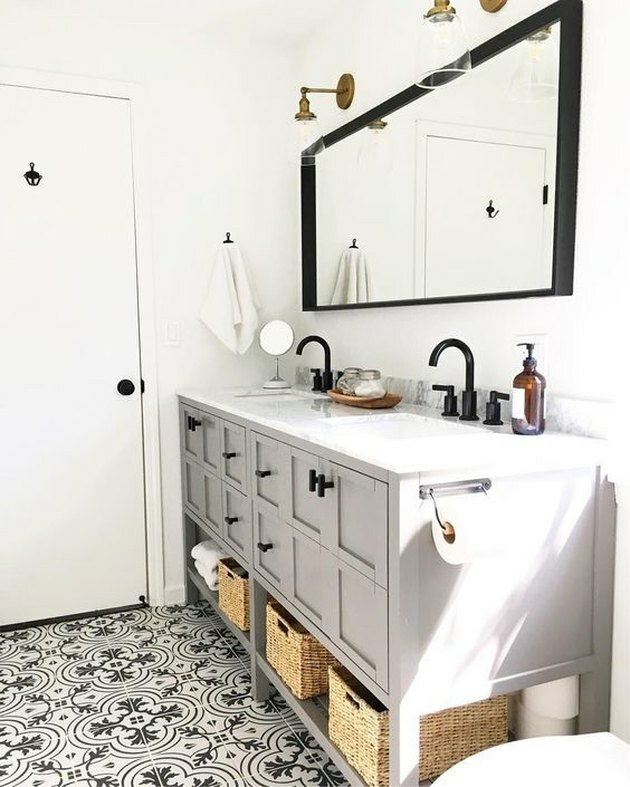 We especially love the way the dark grout lines complement the gray vanity cabinet in this bathroom designed by Kim from The TomKat Studio. 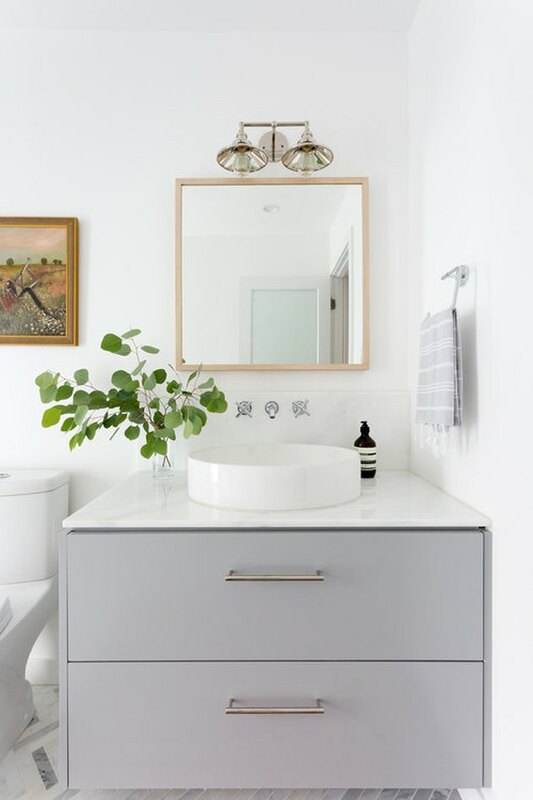 Take notes from this Homepolish design and upgrade your master suite by painting the walls white and installing a floating vanity cabinet finished in a soothing icy blue-gray. The result: a beautifully airy space that promises to help you relax in no time. One of the great things about gray cabinetry is that it's the perfect backdrop if you want to add a pop of color. 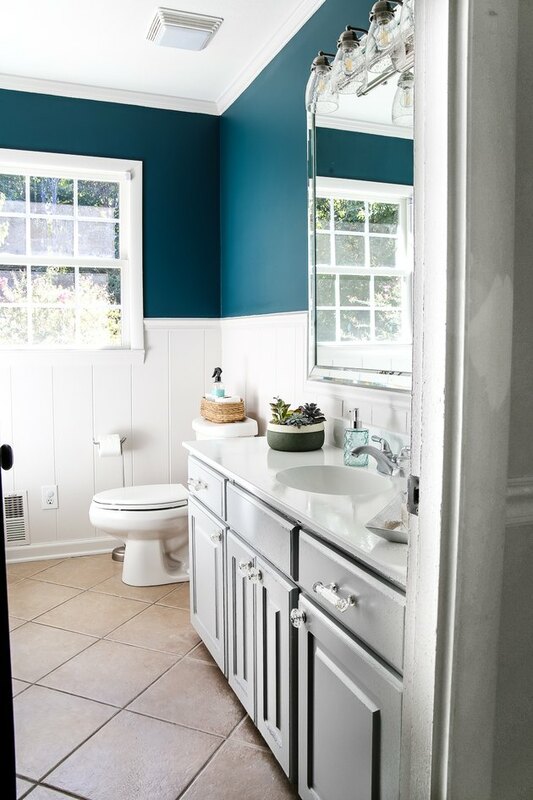 Lauren from Bless'er House painted the upper half of her bathroom walls in a vivid teal. 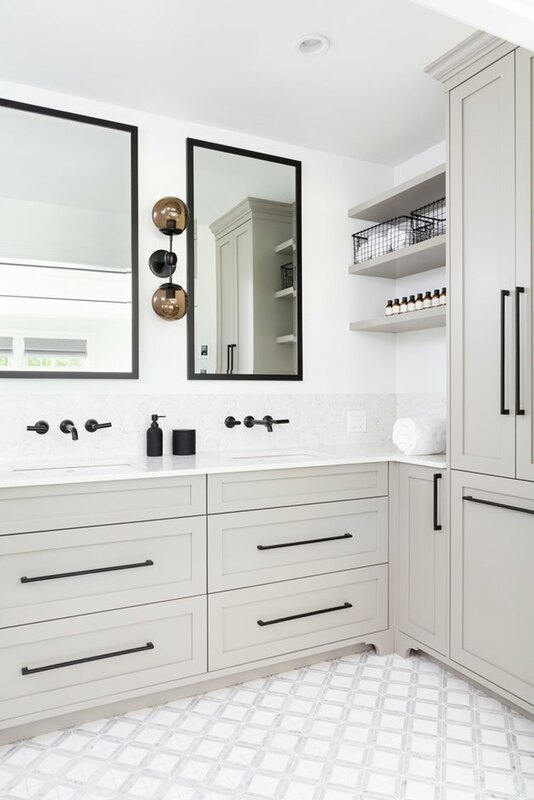 Designer Carly Waters outfitted this luxurious white bathroom with a hint of gray — from the vanity cabinet to the floor tile to the Turkish hand towel — to create a calming retreat. This kids' bathroom designed by Jenny from The Little Green Notebook is just as sweet as can be. Blush-pink decor paired with warm gray cabinetry, brass hardware, and black fixtures, adds a playful hint of glam that both the young and the young at heart can appreciate. If you're itching for gray cabinets but don't want a subtle, toned-down look, try a richer shade. 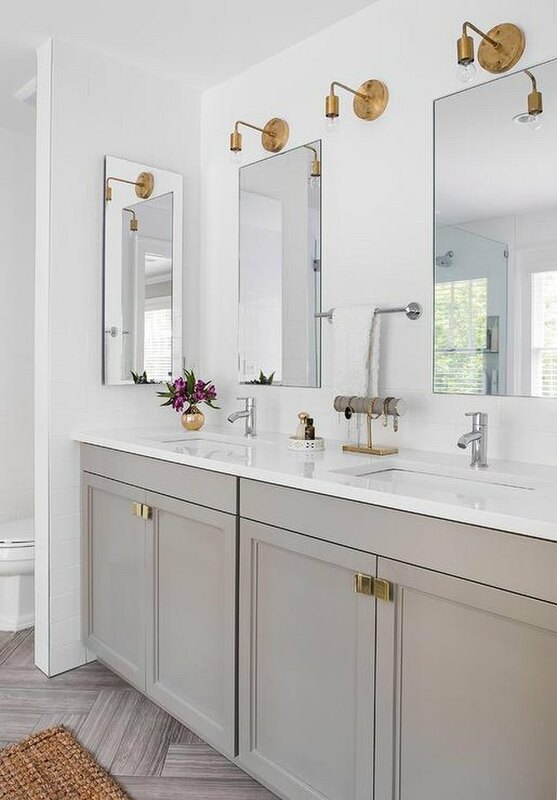 The warm gray cabinetry in this bathroom designed by Terracotta Design Build adds depth, highlighting the brass hardware and light fixtures brilliantly. 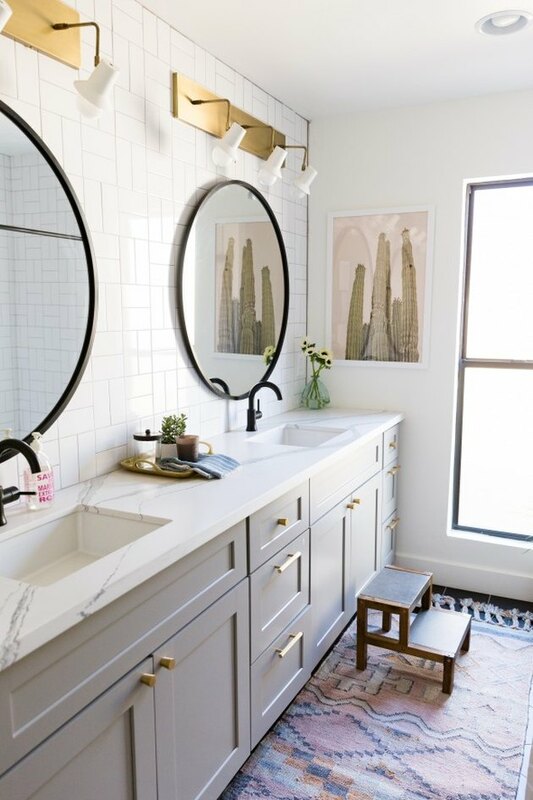 You might be tempted to select brass plumbing fixtures to match the brass hardware on your gray vanity cabinet. Don't. 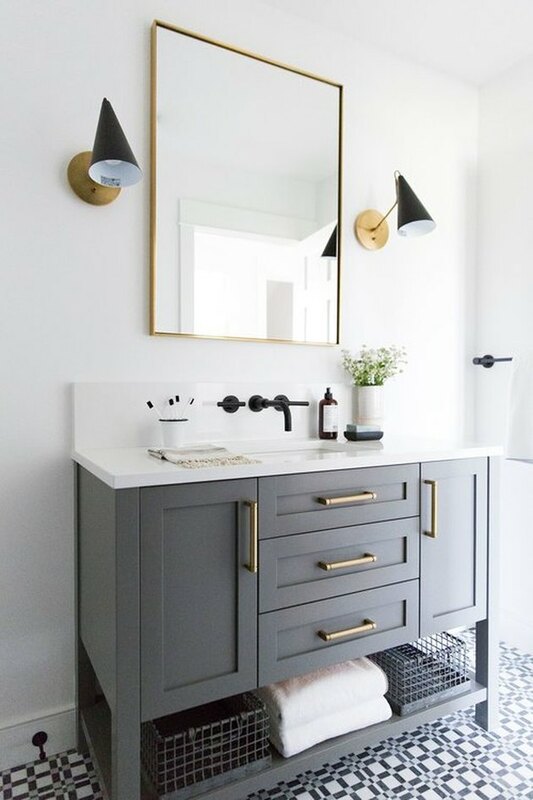 This beautiful bathroom designed by Shea from Studio McGee proves that mixing metal finishes is a stylishly dreamy approach. This dazzling take on country-chic uses brass accents all around. The muted gray cabinetry and white shiplap wall keep things from getting too busy, while the patterned tile flooring imparts a subtle Southwestern vibe. Lack the cash for a full bathroom remodel? This reno from Suzannah over at Create/Enjoy was accomplished for less than $1,500. This includes the cost of the new gray vanity cabinet. Swoon! 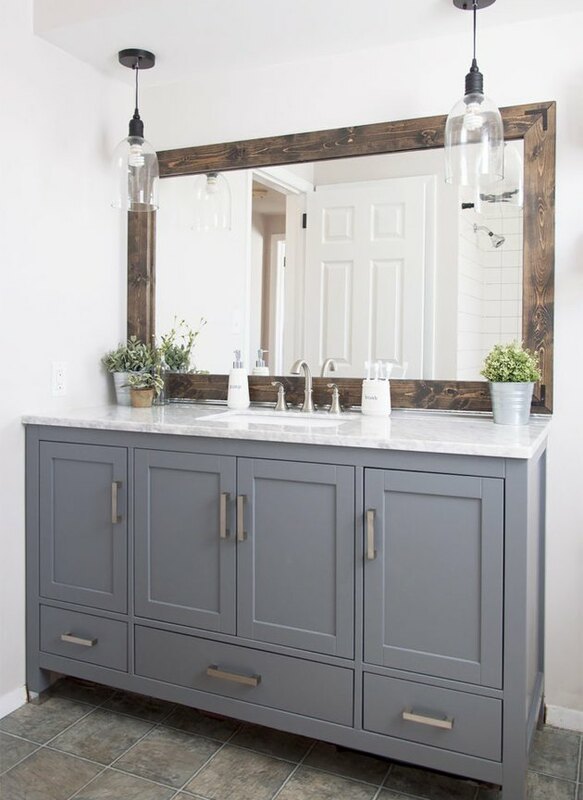 Soften the rugged edges of your farmhouse style bath with gray cabinetry. The calming shade of Ashley from Cherished Bliss' vanity keeps the space feeling modern — and adds a hint of elegance.